EPF Complaint Tracking | EPF UAN Complaint Status Online | EPFiGMS | Lodge EPF Complaints | December 2018 – Have you submitted your complaint on EPF Grievance Portal? Did you know that you can even track your complaints online? Well if you don’t. Be with us and we’ll teach you everything. Today in this article we’ll teach you How To Do EPF Complaint Tracking if you’ve submitted your complaint to the EPF Grievance Portal Online for a quick action. Well, let us tell you that it is a complete online facility for EPF Subscribers. doesn’t matter if you’re a PF Member, EPS Pensioner or an Employer, You can submit your complaints here. Eligibility For EPF Complaint & EPF Complaint Tracking? If you’re facing any issue related to your EPFO Subscription, all you need to have is your Universal Account Number – UAN in order to raise EPF Complaint. If Your Cheque Is Misplaced / Return. Now, Before telling you how you can do EPF Complaint Tracking. Let us quickly tell you how one can submit his/her complaint in EPF Grievance Portal or epfigms.gov.in [EPFiGMS] because not everyone knows how to let EPF knows that what issues you’re facing. 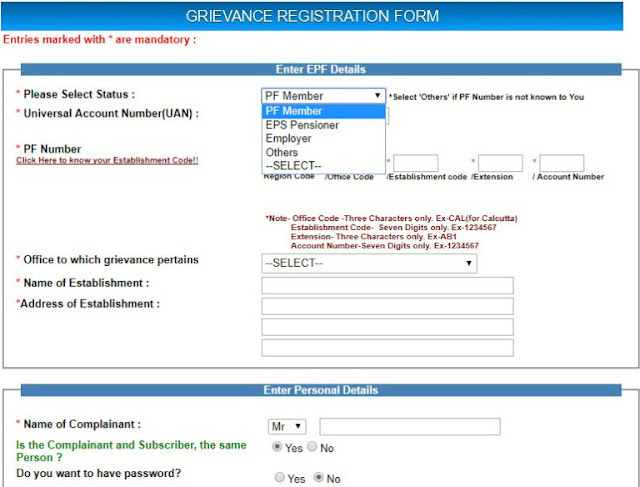 How To Submit Grievance In EPF Grievance Portal? Find and click on the “REGISTER GRIEVANCE” link. 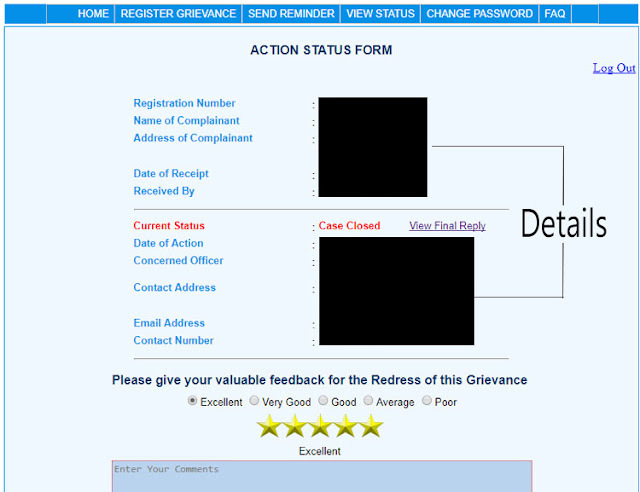 A new page will now pop up, Showing you the exact “GRIEVANCE REGISTRATION FORM” that you need to fill. Select your “Status” from – PF Member, EPS Pensioner, Employer or other. PF member needs to fill their 12 Digit UAN Number and PF Number. EPS Pensioner needs to fill in their PPO Number. Employer needs to provide their Establishment number. Now, Fill the exact name and address of the establishment. After that, Complete the process of filling some of your personal details. Select your complaint type from the given category and type your issue. 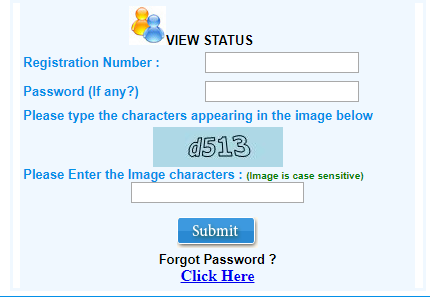 Finally, complete the CAPTCHA and hit the submit button. A registration number will be given to you which will help you for EPF Complaint Tracking. Still Confused About The Steps? Hey… don’t worry! we have created a separate post on this where we have used a complete step by step images in order to resolve all of your queries about the steps. You can access that post by clicking on the given link down below. So, now you have the clear idea how to raise a complaint. We’ll now let you through the main topic. This process is as simple as the last one. Just follow the steps carefully and it’s done. Step 2 – Now find and click on the “VIEW STATUS” link. Step 3 – You’ll now re-direct to a new page where you have to fill in your “Registration Number”. Step 4 – Once you successfully filled in your Registration Number and password. Complete the CAPTCHA and hit “SUBMIT” button. Step 5 – Now on your screen. An action status will be pop up. You must be wondering what Action Status is? You can also give your feedback and submit your comment about your experience. Do share it with others on social media (i.e. Facebook, Whatsapp, Twitter, Reddit) using our given buttons down below. My PF Settlement was done on 16th march 2018, however the amount not credited to my account when i checked with the officer they told by mistake the account number has been wrongly updated by omiiting 0(zero) in prefix of account number. and on same day my grievance has got transfered to Delhi south vide Registration number DELSO/E/2018/81582. Till now i had not received my PF amount. Have you checked the current status of your grievance, the one which was transferred to Delhi (south)? Hello sir,my PF no is TNMAS00487040000032571 and UAN number 100924348830.My pf claim rejected due to date of exit showing February 2017and pf contribution received upto July 2017 by the employer mistake.then submitted JOINT DECLARITION FORM BY THE EMPLOYER But till now I have not received my pf amount.its more than 3 months.please give me corrective suggestions. i have applied for advance pf in online, my claim status is SETTLED, but not received amount, later only i have noticed my account number is wrong, i have updated correct account number, what will do, do i need to re process?.